Besides leasing programs, price suppression through the futures markets, and a mainstream media that vilifies gold at every turn, the U.S. financial system has gone all in for believing that gold will never have a place in monetary system. 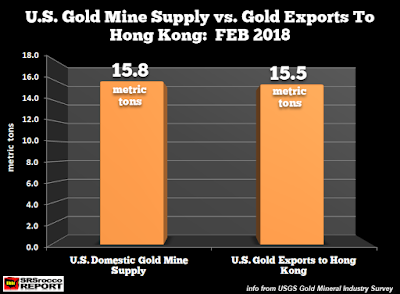 And in a new report from SRS Rocco on April 28, it appears that we are even shipping all of our own mine output to China. Perhaps the biggest irony in all of this is that a Congressman from West Virginia has submitted a bill to once again back our currency with physical gold, but if we are shipping it offshore as fast as we mine it, how would we have any gold to back this legislation?